James Basson MSGD and John Moreland FSGD have taken the two most prestigious awards at the Society of Garden Designers’ fourth annual awards ceremony, receiving the Grand Award and Judges’ Award respectively in front of an audience of almost 400 guests. 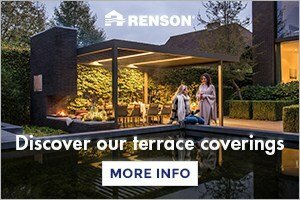 The accolades were presented at a ceremony in London where 19 awards were announced including recognition for community garden projects, international schemes, excellence in public and commercial outdoor space and a special lifetime achievement award. There was a unanimous decision to give John Moreland FSGD’s garden for Newton House (picture below) the Judges Award as an almost faultless example of traditional values. 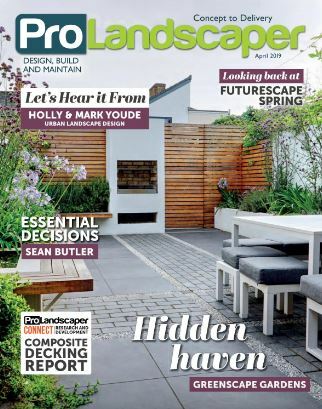 The judges said: the impressive garden conceived from scratch was a ‘very beautiful transformation with a fantastic sense of place, excellent scale and proportion and a design that sits effortlessly in the countryside setting”. Arabella Lennox-Boyd MSGD took the Historic Garden Restoration Award for the garden at Eaton Hall, which the judges felt was arguably one of the most important garden restoration projects in the UK in recent years. 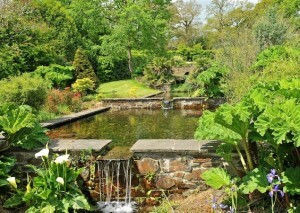 Developed over 24 years, it includes 88-acres of gardens and a 9-acre lake. The judges called the project a “masterclass in design and planting” and remarked on the “exhaustive historical research” saying the result was “traditional, contemporary, ecological and practical in equal measures and provided a legacy for future generations”. 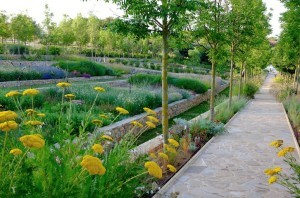 Emily Erlam, a newcomer to The SGD Awards, was granted two accolades. 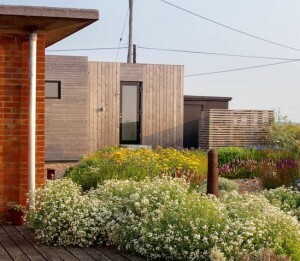 She received the Small Budget Garden Award for a garden for a beach house converted from an old marine testing station (pictured below) that the judges described as ‘thoughtful, naturalistic and fun’. She was also named one of the two ‘Future Designers’ for a modern country garden concept that the judges called ‘skillful and confident.’ She shares the title with joint winner David Loy. The three, now-familiar, Residential Garden prizes went to John Moreland FSGD, Keith Pocock MSGD and Charlotte Rowe MSGD who took the Large, Medium and Small Residential Garden Awards respectively. Other awards won on the night included: John Wyer FSGD in the Public or Commercial Outdoor Space category; Juliet Sargeant MSGD in the Hardscape category; Stuart Craine MSGD in the Pocket Garden category; Joanna Midwinter in the Paper Landscapes category and Joe Swift MSGD who won the People’s Choice Award – the only award in the competition determined by public vote. The Designing for Community Space Award, which is granted to a community project, went to the Braehead Community Garden in Scotland. This year the Society introduced two new Student Awards covering domestic and commercial design. Both hotly contest titles were scooped by, rising star Tom Massey for his conceptual designs for France Farm and the Cassell Hospital Ecotherapy Garden respectively. The judges said Tom was ‘a clear winner in both categories’ who demonstrated a sensitive use of historical landscape and a confident and sophisticated approach to the handling of the space’. They described his projects as as ‘good, honest design that was conceptually interesting and well laid out’ and remarked on his competent handling of complex scales and architectural styles. Other special awards given on the night included The John Brookes Lifetime Achievement Award – an award, named after one of the Society’s Life Members and granted to an individual who has made an outstanding contribution to the landscape and garden design profession. The Award, which is gifted by the Council of the Society of Garden Designers, was given to designer, author and teacher Robin Williams FSGD.